the results of the referendum on July 5. Greeks overwhelmingly rejected conditions of a rescue package from creditors on Sunday, throwing the future of the country's euro zone membership into further doubt and deepening a standoff with lenders. As the euro slid more than 1 per cent against the dollar and European stock and bond markets were poised to take a sharp hit with the resumption of trade on Monday, stunned European leaders called a summit for Tuesday to discuss their next move. Thousands of jubilant Greeks waving flags and bursting fire crackers poured into Athens' central square as official figures showed 61 per cent of Greeks had rejected a deal that would have imposed more austerity measures on an already ravaged economy. "You made a very brave choice," Prime Minister Alexis Tsipras said in a televised address. "The mandate you gave me is not the mandate of a rupture with Europe, but a mandate to strengthen our negotiating position to seek a viable solution." The surprisingly strong victory by the 'No' camp defied opinion polls that had predicted a tight contest after a week of rising desperation as banks shut and cash machines ran dry. 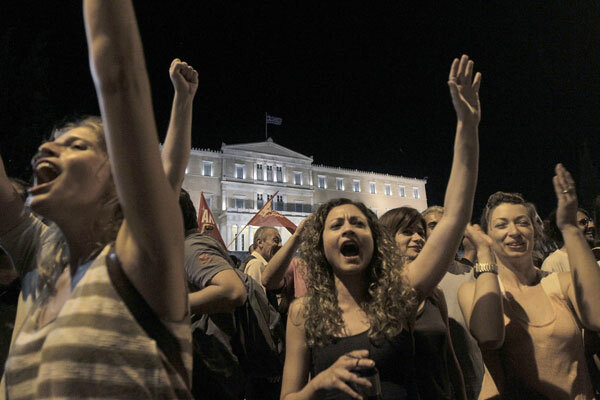 The vote leaves Greece in uncharted waters: risking a banking collapse that could force it out of the euro. Without more emergency funding from the European Central Bank, Greece's banks could run out of cash within days. That might force the government to issue another currency to pay pensions and wages. For millions of Greeks the outcome was an angry message to creditors that Greece can no longer accept repeated rounds of austerity that, in five years, had left one in four without a job and that shrank the economy by a quarter. Tsipras has denounced the price paid for aid as "blackmail", a national "humiliation". "The message from the 'No' is that we're not scared after all the pressure that we faced from both Europe and within," said Stathis Efthimiadis, 47-year-old teacher. "We want to live fairly and freely within Europe." Officials from the Greek government, which had argued that a 'No' vote would strengthen its hand to secure a better deal from international creditors after months of wrangling, immediately said they would try to restart talks with European partners. But euro zone officials shot down any prospect of a quick resumption of talks, even though finance ministers were planning to meet during the week to discuss the fallout from the vote. German Chancellor Angela Merkel and French President Francois Hollande will meet in Paris on Monday afternoon. "Tsipras and his government are leading the Greek people on a path of bitter abandonment and hopelessness," Germany's economy minister Sigmar Gabriel told the Tagesspiegel daily. He said negotiations with Athens now were "barely conceivable". Many of Athens' partners have warned over the past week that a 'No' vote would mean cutting bridges with Europe and driving Greece's crippled financial system into outright bankruptcy. The result delivers a hammer blow to the European Union's grand single currency project. Intended to be permanent and unbreakable when it was created 15 years ago, the euro zone could now be on the point of losing its first member with the risk of further unravelling to come. "I believe such a result can be used as a strong negotiating tool so that Europeans can understand that we are not a colony," said Nefeli Dimou, a 23-year-old student in Athens. With Greece facing its worst financial crisis in recent memory, Tsipras said Athens was returning to the negotiating table with the express goal of reopening banks who have been shut for over a week with the imposition of capital controls. The ECB, which holds a conference call on Monday morning, is likely to maintain emergency funding for Greek banks at their current restricted level and avoid the drastic measure of yanking support, people familiar with the matter said. Even then, the banks are expected to struggle as Greeks besiege cash machines to withdraw a maximum of 60 euros ($66) daily, though government officials have vociferously denied any plans to issue a parallel currency. Fears have grown of a shortage of petrol and medicine supplies if the cash squeeze continues. "After the 'big no' it is now a race between two forces: political pressure for a deal, versus the impact of banking dysfunction within Greece," J.P. Morgan said in a research note. "Although the situation is fluid, at this point a Greek exit from the euro appears more likely than not." The referendum call by Tsipras eight days ago came after months of fruitless negotiations with European and International Monetary Fund creditors since the radical leftist government took power in January. That follows seven years of deep economic crisis that has stoked violent protests and driven youth jobless rates to nearly 50 per cent. Unable to borrow money on capital markets, Greece has one of the world's highest levels of public debt. The IMF warned last week that it would need massive debt relief and 50 billion euros ($55 billion) in fresh funds. Opinion polls over the months have shown a large majority of Greeks want to remain in the euro. But many appear to have shrugged off the warnings of disaster, trusting that a deal can still be reached without the tax hikes and pension reform demanded by lenders and rejected by Tsipras.